I reported it here last month, but TV funnyman Stephen Colbert just caught wind of it. A certain group of Marines in Afghanistan were asked by their leaders to avoid farting audibly around their Afghan partners because they are offended by flatulence. We don’t really know why the Afghans are offended, they just are. 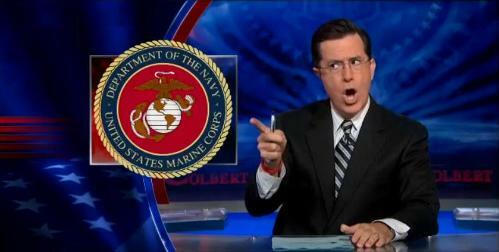 Even though he picked up an MRE and pointed out that “we cannot fill these soldiers with MREs, then ask them to cease fire,” it’s a pretty funny moment of Colbert outrage. For the record, yes, that was this blog that appeared on last night’s show. Colbert was hilarious ….thanks Gina for giving providing the info…once again proving….true life is often truly funny! Can we get the Afghans to bathe? I know a few boys that are offended by their BO. @ Jen – Hey, good point. I mean, as long as they’re here in our country they should do everything not to offend us. …. oh, wait a sec….